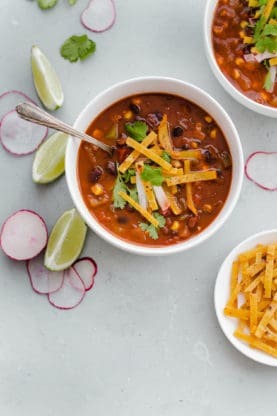 Chipotle Black Bean Tortilla Soup – Smoky and flavorful with the perfect amount of heat, this effortless vegan soup is wonderful all year round on busy weeknights. The weather is officially breaking y’all! I’m talking 50 degree weather in Chicago, which is pretty darn impressive. However, I’m not totally convinced that we are out of the winter woods just yet. This Chipotle Black Bean Tortilla Soup from my boos A Couple Cooks‘ new cookbook Pretty Simple Cooking is just the ticket to coast me through this weather until spring consistency arrives. I first met Sonja, one half of the cooking couple, through email when she asked me to be a guest on her podcast. We hit it off immediately and have been chatting through email and on Instagram about life, especially our little ones, ever since. I just adore her and was beyond excited to get my hands on the cookbook. 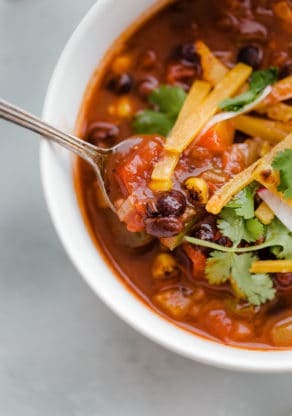 Seeing this flavorful version of a tortilla soup really spoke to me. I had to try it! I am one of those people that just loves a good soup, and this one is perfection my peeps. On top of the fact that it is vegetarian and vegan friendly, I did not miss the meat in the slightest. The smokiness from the chipotles in adobo sauce adds the perfect kick of heat and spice. The soup isn’t difficult to prepare and comes together quickly. It would be absolutely perfect for dinner this week. 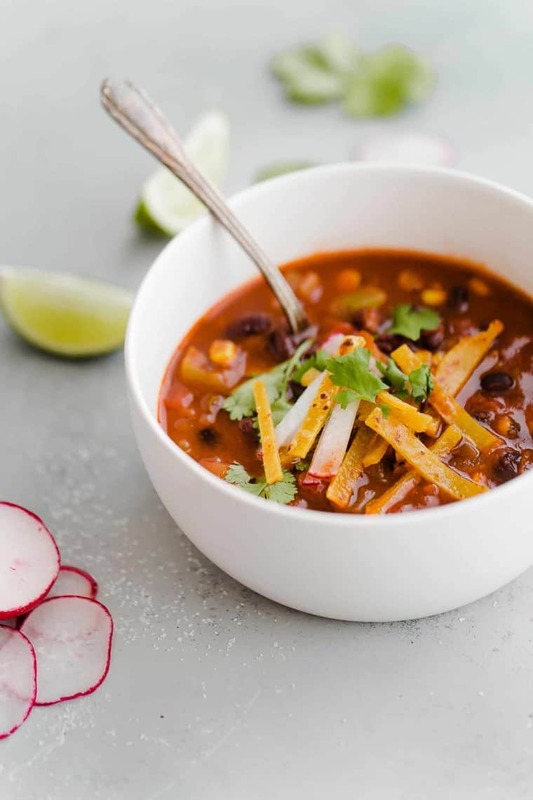 Healthy, nutritious and incredibly filling, you definitely want to try this soup before the weather warms up too much. Get at it folks! Recipe below. 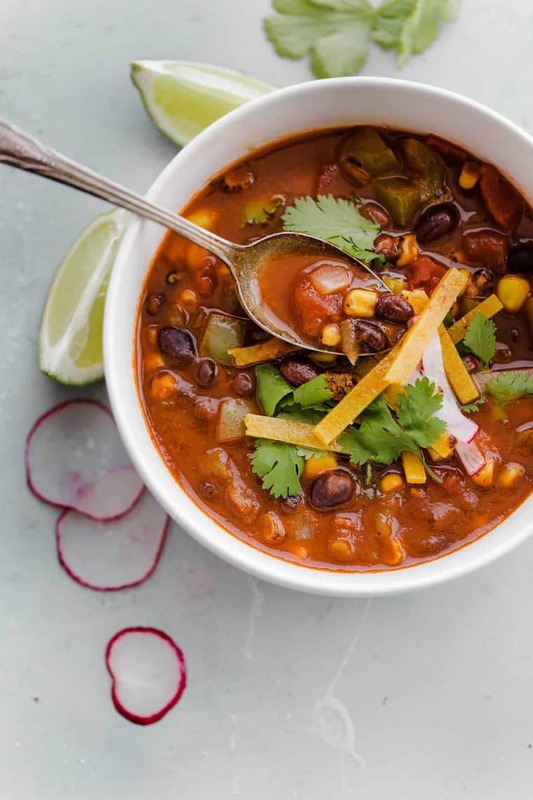 Smoky and flavorful with the perfect amount of heat, this effortless vegan soup is wonderful all year round on busy weeknights. Make the tortilla strips: brush the tortillas lightly with olive oil on each side. using a pizza cutter, slice them in half, then into thin strips. place the strips on a baking sheet and sprinkle with kosher salt. Bake for 10 to 12 minutes until crispy and lightly browned. Make the soup: peel and dice the onion. dice the green pepper. peel and mince the garlic. drain and rinse the beans. In a large pot of dutch oven, heat 2 tablespoons olive oil and saute the onion until translucent, about 5 minutes. add the green pepper and the garlic and saute for 2 minutes. stir in the oregano and the cumin for 1 minute. add the tomatoes, beans, corn, adobo sauce, broth, and kosher salt. bring to a boil, then simmer for 10 minutes. taste and add additional adobo sauce or kosher salt if desired. Prepare the garnishes: slice the radishes. slice the lime into wedges. To serve, ladle the soup into bowls and allow to cool to warm. garnish with tortilla strips, radishes, torn cilantro leaves, hot sauce, and plenty of lime juice. *Use 1 tablespoon adobo sauce from the can, the peppers and remaining sauce can be reserved (or frozen) for future use. This is a fantastic soup! So rich in flavor and so easy! It looked so good that we doubled it, and we’re so happy we did, because now we have so much more to enjoy. We threw in a red pepper and some carrot for more color, and they were excellent in it. And since my guy loves things hot, we cut up the chipotle from the adobo sauce and added that too. Superb! Thank you, beautiful Jocelyn, for making everyone think I’m a good cook! 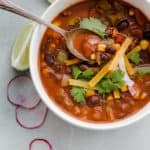 It does not feel like winter, here in TX but, I love soup. I will enjoy eating this on sunday!!! My beans are already soaking! Thanks for sharing! Fantastic!!!! Let me know how it tastes. I’m trying this recipe today! It’s snowing and it would be perfect to have soup and a sandwich for dinner. Congratulations on your new baby!! She’s so beautiful! I know y’all are excited!! 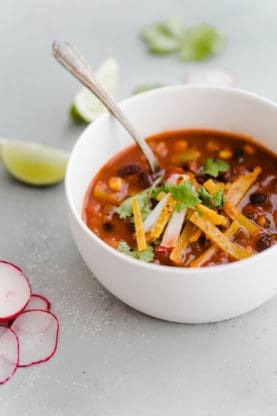 I’m not a vegan either but this soup looks so good. THANK YOU so much for your kind words about Pretty Simple Cooking & this soup!!! Your photos are INCREDIBLE and I just want to jump in that soup bowl! ALSO I just cannot believe you’re posting already after little baby girl — you are a rockstar! Thank you so, so much for all your support– and I adore you back, times 1000.